Connect a Dymo Labelwriter via USB to your PC running Restoration Manager and you can print labels containing the part number, location and description - what could be easier? Restoration Manager will work with the older Labelwriter models, the 310, 320 and 330 Turbo, and the latest 400 and 400 Turbo models using Dymo's large address labels (89mm x 36mm). 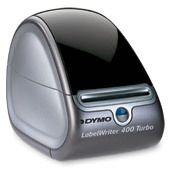 Dymo Labelwriters use direct thermal printing so no ribbons, toner or ink cartridges are needed and the 300 dpi resolution provides laser-sharp labels in seconds. In addition to working with Restoration Manager, Dymo Labelwriters also work with popular applications such as Microsoft Word and Outlook and comes with custom software for designing your own labels.